Updated: Beacon Power, the flywheel maker that filed for bankruptcy last month after winning a $43 million loan guarantee from the Department of Energy, announced on Saturday that it plans to sell its 20 MW flywheel plant in Stephentown, New York, to pay back the DOE loan. Beacon Power has been in negotiations with the DOE about how to pay back the loan and also continue operations, and Beacon says the DOE loan office’s “highest priority was to recover as much of the $39.1 million loan balance as soon as possible,” which led to the decision to sell the plant by January 30, 2012. The cost to build the plant all-in (legal, due diligence, interconnection and equipment/construction) was $69 million. Last week as part of our standard 3rd quarter financial filing with the SEC, we took an impairment charge on our books that wrote down the value of the plant for accounting purposes to $12.5 million. This drop was based on several linked factors: the very low rates for regulation service in NY (hence the plant’s ability to make money); the fact that the parent company (Beacon) is in Chapter 11 bankruptcy and without Beacon to run it the plant is worth less than were we to remain whole; and then our auditors applying standard GAAP formulas to all of the above. With the seemingly endless attention on the bankruptcy of Solyndra (DOE Secretary Steven Chu was grilled last week), which received a $535 million loan from the DOE, the DOE can’t afford to be lenient with companies when it comes to paying back the loans. One of the things that came under scrutiny the most from the Solyndra debacle was that the DOE decided to restructure Solyndra’s loan earlier this year when it became clear Solyndra was struggling. Beacon says it will try to raise more money from private investors to reorganize and continue operations and says it is in preliminary talks with some strategic investors and private equity firms. Beacon says that the recent ruling by the Federal Regulatory Energy Commission, which supports energy storage technologies that can provide quick bursts of power to the grid to help it run more smoothly, will be a boon to its business. Beacon makes flywheels, which are energy storage devices in the form of large spinning discs contained in a vacuum that keep electricity flowing over the power grid at a steady frequency. The technology has struggled to reach a mainstream market, but the idea is that flywheels can help stabilize the grid and allow it to run more efficiently. They also need little maintenance over their 20-year-plus life span, and they don’t have some of the toxic chemicals found in many batteries. 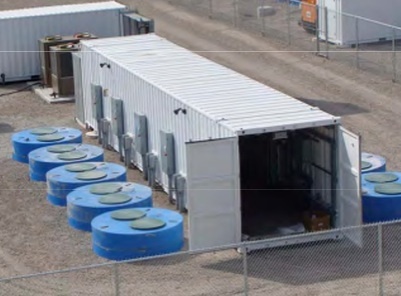 Flywheels are most commonly used as backup power for emergency power systems — what’s called uninterruptible power supply, or UPS — and facilities like data centers sometimes use them when grid power is halted. Beacon’s 20 MW flywheel energy storage plant in Stephentown, N.Y. — the first full-scale commercial deployment of its technology — was built to absorb and discharge energy to the electric grid, making it possible to use more variable renewable energy sources like solar and wind. Reuters reported last month that Beacon has $72 million in assets and $47 million in debt.